Our “virtual TV series” is essentially a set of ideas, scripts, notes, and suggestions for a series of episodes that could eventually be illustrated (as a graphic novel), animated, videotaped, or otherwise developed, ideally through an “open-source” model, crowdsourcing the content, the dramatic elements, and the graphics. Here’s a diagram of the concept, and some background as to where we are currently with it. Stay tuned for more on this by signing up for our newsletter or subscribing to our blog posts. In this connection we had a bit of a wild idea, and that was to imagine a TV series based on Possible Planet, with the first episode built around Global 4C and what its implementation might look like, especially given your penchant for presenting it in the form of a narrative. 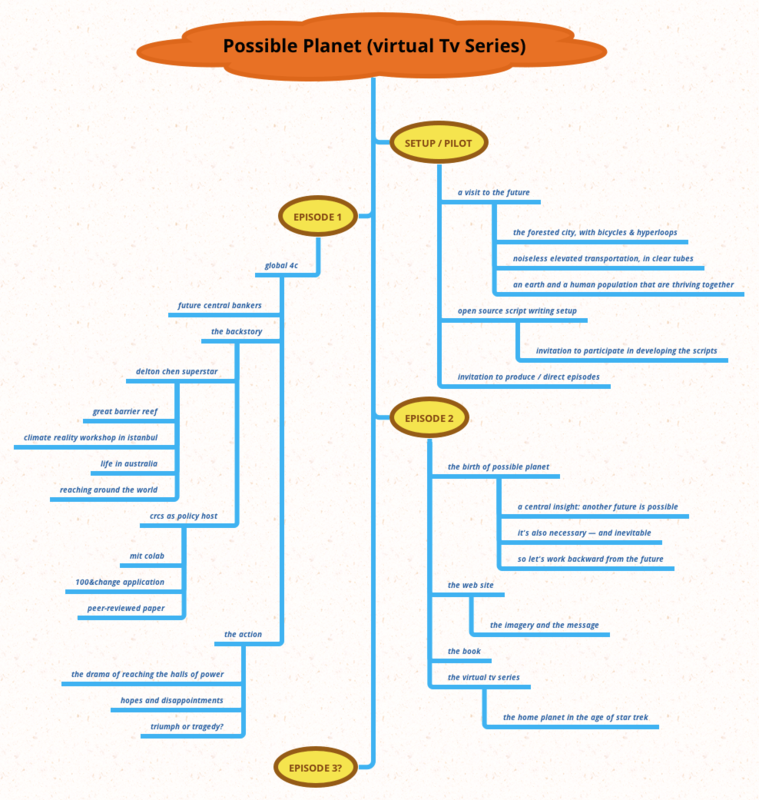 At this point it seems a bit far-fetched, but it led to the idea that we could post a “virtual TV series,” with script outlines, on the web site, and even invite others to contribute to the scripts and the ideas on an “open source” basis. The overall concept would be a visit to the future, sometimes positive, sometimes scary, but trying to put the reader at the center of it. I generally like the idea of story telling and creating a narrative – as you described – and I think your ideas are at the scale that we would need to have a major voice in the ecosystem of ideas. I doubt that even Paul Hawken will come on board until we can actually get a chance to talk to him. He is on another planet with Chad cutting the relationship. We will need to work on that after the book chapter – I made some more edits and posted it to the reviewer – fingers crossed!! I have been thinking about the narrative and I do believe that the new economy people (I mean the so-called thought leaders in progressive economics) have made an error by following the Herman Daly school of steady-state, which is a model that is appealing to the ecological economics. The sad irony is that steady state is totally unnatural and is not how ecosystems or biology actually works. They should know this but they have no other model to believe in, and so they have created a myth and an ideology, which excludes people like me from the narrative (it is intentional exclusion to push their models). The next step is to lay down the plan to get from the rough concept to at least a preliminary implementation. The initial outline diagram shows what we want to create. The first question is, perhaps, whether we need a separate web site to build the series, and/or a special set of tools to allow people to contribute materials, script elements, and so on to the series. If you have a suggestion for the best way to do this, please leave a comment below.